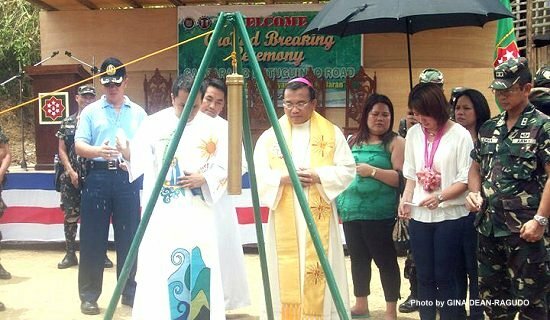 CAMP LUKBAN, Catbalogan City – After conceptualizing Gandara-Matuguinao Road Project, the simple yet meaningful Ground Breaking Ceremony was held at Brgy. Canjumawid, Gandara Samar at around 10:30 AM on Wednesday (July 20). This road rehabilitation is part of the project proposals of the Command to the different Local Chief Executives pushed thru the Regional Development Council, Regional Peace and Office Council and Provincial Peace and Order Council. The project is a 3.7 km road rehabilitation to be undertaken by 546th Engineering Construction Battalion, 53rd Engineering Brigade costing about P2.1 million funded by the Provincial Government of Samar. The ceremony was spearheaded by the Commander of 8th Infantry Division Major General Mario F Chan together with Honorable Governor Sharee Ann T Delos Santos, Most Rev. Isabelo Abarquez, Bishop of Calbayog Diocese; Rev. Fr. Erwin Rodriguez, Parish Priest of Matuguinao; Police Senior Superintendent Ronald Cortiz Macapagal, the Provincial Director of Samar; Commanding Officer of 801 Brigade Commander Colonel Romeo Labrador and other military officers, local officials and media personnel were present to witness the realization of the road project that will be completed by 26 September 2011. Right after the ceremony, the activity was culminated with press conference. “Hindi sa pamamagitan ng bala matatapos ang insurhensiya sa Samar, matatapos natin to sa pagbibigay ng tulay, maayos na daan at iba pang infrastraktura para matugunan ang pangunahing pangangailangan ng mamamayan ng Samar” Major General Chan says. Meanwhile, Governor Tan-Delos Santos expressed her gratitude to the Commanding General of 8ID and encouraged the people of Gandara and Matuguinao to be responsible in order to achieve peace and order in the area. CAMP LUKBAN, Catbalogan, Samar – Headquarters-bound troops who recently performed as area security in support of the ground breaking ceremony for the Gandara-Matuguinao road development project held yesterday were harassed at about 11:30 p.m. last night along the way by a communist-inspired criminal group at the vicinity of Barangay Canligues and Concepcion, both of Paranas, Samar. Two UN-banned landmines usually employed by the communist-inspired criminal group detonated along the road that caused the death of one soldier, the wounding of six others, and damage to a portion of a currently developed road. The wounded soldiers were immediately evacuated and are now under treatment at Saint Paul’s Hospital in Tacloban City. Responding troops in the area are now making sure that the traffic along the route will not be hampered because of the incident. The incident is an expected reaction of the communist-inspired criminal group against the efforts of the 8th Infantry Division who has committed to support road development and other related projects in the Region at all cost. The road where the incident occurred is among the roads that the 8ID supports for development. In light of the revelations in connection with the misuse of the multibillion funds of the Philippine Charity Sweepstakes Office (PCSO) in the past, Senator Chiz Escudero has moved to contain the discretionary powers of its board over disbursement of charity funds. Escudero filed Senate Bill No. 2892 in order to institutionalize a just and equitable distribution of the PCSO charity funds. “We are amending Section 6 of the agency’s charter as it has sanctioned the promotion of patronage politics and has also become a source of injustice and inequality with the way all these hearings have shown as to how the charity fund has been disbursed with bias for or against those who are in power," Escudero said. This particular provision of the PCSO charter divides its net receipts to 55 percent-45 percent distribution. The former is earmarked to winnings and prizes, and the latter to charity fund and operating expenses and capital expenditure. The PCSO board of directors is empowered to make payment and grant from the charity fund, which is set at a minimum of 30 percent of net receipts. To top that authority, it is also authorized to earmark a minimum of 15 percent of net receipts for operating expenses and capital expenditures. In the 2009 Commission on Audit (COA) report, the agency’s disbursement from its charity fund amounted to a whooping P6.2 billion. The disbursement includes the highly questionable intelligence funds maintained by the PCSO. “I am proposing that the board's discretionary powers be removed and that the charity fund be specifically earmarked based on the policies and mandate of PCSO," Escudero said. He also sought the expressed approval of the Office of the President in cases when the board needs to allocate over 15 percent of the charity institution's funds. “The PCSO fund mess controversy has shown how the charity fund has been mishandled and misused. This bill is a move to ensure that the government's money will be distributed in accordance with specific and real needs grounded on justice and equity," the senator explained. Escudero said that the proposed measure, once passed into law, will eradicate the lack of institutionalized criteria and standard in the disposition of fund. “Arbitrariness has always led to abuse. We want transparency. As I have always espoused, remove discretion, you can lessen, if not totally remove corruption," Escudero added. NO QUORUM. Where have all the Board Members gone? Bad politics picked them, every one. When will they ever learn? When will they ever learn? This is the common scenario at the Samar SP Session Hall during regular session days. 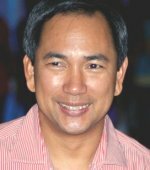 CALBAYOG CITY – Philippine Councilors League (PCL-Samar) Chapter Chair Rogelio Casurao dismissed some allegations that the majority bloc deliberately makes absences from attending the Sangguniang Panlalawigan regular sessions in order to block the efforts of the provincial government. In an interview with Samar News.com, he clarified that they have been conducting regular or even special sessions here in Calbayog City for four consecutive times in the absence of the minority. “Under our Internal Rules, conducting sessions in other parts of the province is allowed, and the Sanggunian acting on its collegial level can appoint anyone to act as secretary in the conduct of the session,” said Casurao. A reliable source said that both the majority and the minority members of the August body have not convened since its last session on April this year. The problem of constituting a quorum for the province will not be resolved while the opposition is being deprived of their allowances that will allow them to discharge their duties and functions as board members, Casurao revealed. While the pro administration is enjoying their privileges like brand new cars and many others, the opposition members are being denied and battling on their remuneration (i.e. gasoline, communication and travel) including the salaries and wages of their respective staff, he added. 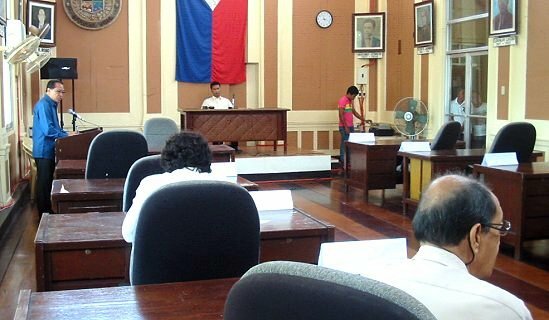 The PCL Chair said that Calbayog and Catbalogan has a distance of more or less 75 kilometers and by ordinary computation, 20 liters of gasoline is necessary to negotiate a round trip activity like attending the regular session at the province. Furthermore, the June 9 scheduled regular session where the indignation rally was concurrently conducted in Catbalogan City had been questioned by the opposition. But Casurao said they acted on their personal capacity as citizens who have the “right to peaceably assemble and express redress and grievances”, like talking on their opinion on the latest political development in the province. Lastly, the PCL Chair also denied the P3M bribe of the provincial governor just for the approval of the 2010 budget. Laughing on the issue, he clarified that nobody from them received such amount of money from the office of the governor. The 2010 budget of the province which had been decided by the Court of Appeals in favor of the respondents was remanded to the court a quo – the Regional Trial Court Branch 31 Calbayog, acting on the motion for reconsideration filed by the complainants, thus ordering said court to expedite the proceedings for the immediate resolution of the case, Casurao disclosed. He believes that whoever is responsible for disbursing money under a questioned budget will be held liable. MALACAÑANG – Government workers retiring from the service may soon enjoy their retirement benefits and gratuities earlier than usual after President Benigno Aquino III signed into law a legislation that would hasten the release of such claims, Executive Secretary Paquito N. Ochoa Jr. announced on Tuesday. Ochoa said Republic Act (RA) No. 10154, signed into law by President Aquino on July 15, requires all state agencies to release the retirement benefits within 30 days after the actual date of retirement of a government employee. It also provides for penalties for unjustified delays in the release of these benefits. RA 10154 shall take effect 15 days following its publication in the Official Gazette or in two newspapers of general circulation, Ochoa said. Under the newly signed law, Ochoa said the employer-agency, the Government Service Insurance System (GSIS), Home Development Mutual Fund (HDMF) and the Department of Budget and Management (DBM) are directed to ensure that all the benefits of a retiring government worker are released on time. “Government officers and employees have spent the best years of their lives in public service and it is only appropriate that they be extended what is due them under our laws without unwarranted delays,” Ochoa said, noting numerous complaints about the delay in the release of state workers’ retirement benefits. To ensure compliance of the 30-day prescribed period, the law orders retiring employees to submit their requirements to the concerned government agency at least 90 days before the effective date of their retirement. In the event an employee has a pending case and his retirement benefits are being lawfully withheld due to possible financial liability, the head of the agency handling the case is directed to terminate or resolve the case three months prior to his actual retirement date. Failure to resolve the case within the prescribed period without justifiable reasons will cause the immediate release of the employee’s retirement benefits without prejudice to the ultimate resolution of the case. RA 10154 covers all branches, agencies and/or instrumentalities of the government, including government-owned and/or -controlled corporations (GOCCs), but excluding personnel of the Armed Forces of the Philippines (AFP). The law shall be applicable both to applications for compulsory retirement and optional or early retirement as authorized by law. PASAY CITY – Amid the resurrection of election cheating allegations during the Arroyo administration, Senator Chiz Escudero today filed a joint resolution asking both chambers of Congress to determine the real winner in the 2004 presidential race. Last week, former Autonomous Region in Muslim Mindanao (ARMM) governor Zaldy Ampatuan and former Maguindanao election supervisor Lintang Bedol have come forward and accused ex-president Gloria Arroyo of orchestrating the rigging of election results in 2004 and 2007. Under Senate Resolution No. 534 (SRN 534), Escudero, chairman of the Senate committee on justice and human rights, is seeking the creation of a fact-finding commission to look into the 2004 electoral fraud. The senator, who was the spokesperson of then presidential candidate Fernando Poe Jr. (FPJ), said the move will help bring closure to allegations of massive poll fraud that benefited Arroyo, who ran against the king of Philippine movies. “The ghost of 2004 has continuously haunted our democratic system and electoral processes. We need to establish a fact-finding commission, define its powers and functions to enable it to make recommendations on who to recognize as the true fifteenth president of the republic,” Escudero said. He said that unlike any other elections, the 2004 election has remained unsettled and can no longer be resolved given that the acts or omissions of electoral fraud have already become academic, if not dismissed or mooted. Escudero said the controversies surrounding the 2004 presidential elections could have been resolved by the Presidential Electoral Tribunal were it not for the untimely demise of FPJ. “This move is geared toward setting the record and correcting history. It is not about prosecuting or persecuting former president Arroyo; this is about uncovering the truth and to serve and give corresponding recognition to FPJ if indeed it can be given by that commission,” he said. Escudero is proposing the creation of the fact-finding commission which will be composed of a retired justice from the Supreme Court, who will be appointed by the President and will serve as chairperson; the secretary of the Department of Justice; a commissioner of the Commission on Elections to be chosen by the head of the poll body; the Ombudsman; and a senator and a representative to be named by the Senate President and the Speaker, respectively, as ex-officio members. To issue rules and regulations on the receipt, evaluation, admission and custody of evidence in accordance with the policy set forth in the joint resolution. 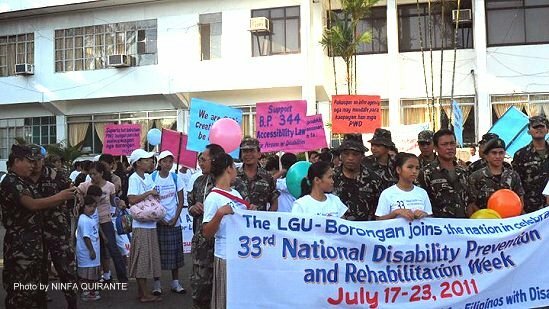 BORONGAN City, Eastern Samar – Borongan Mayor Ma Fe Abunda, in an effort to inspire persons with disabilities inspired them to aspire to be like persons without disabilities. In today’s commemorative program of the 33rd National Disability Prevention and Rehabilitation Week (NDPRW) at the Borongan City Cultural Stage, Mayor Abunda addressed PWDs who gathered to join a myriad of activities for their kind. “Nobody has a monopoly of all blessings,” Abunda told them. Abunda added that even normal people still have some unfulfilled needs. “There will be some aspects missing,” she added. The mayor talked in both English and the dialect. She also hailed the PWDs who continue to strive and show that they are not liabilities to the society. She proudly informed them that she has approved the PWD Code that Sangguniang Panglungsod Jennifer Anacio sponsored. “I did not think twice in approving the Code,” she said. To implement the discounts afforded to PWDs, the mayor said she has ordered the city social welfare and development officer to distribute purchase booklets. Abunda though admitted that the city hall and the roads in the city are not yet accessibility law compliant. But the Mayor with SP Anacio who is herself a PWD pledged to implement the accessibility law before their terms end. Aside from Anacio, SP members Aurora Anasarias and Napoleon Bebita are also supportive of the PWDs in Borongan City. CATBALOGAN CITY – As part of the prepared activities for the forthcoming 23rd Anniversary of the 8th Infantry Division, Philippine Army, a weekly talent search is being held at the camp’ covered court every Friday evening. Dubbed as the Stormtrooper’s Wow Talent Search, it intends to tap the potentials of military personnel by showcasing their skills in dancing, singing and all other forms of entertainment. The organizers required the nine (9) competing battalions/units within its area of command to submit their respective entries. The activity is made open to the public where three (3) independent non-civilian personalities were invited to judge the weekly competition. Winners are declared based on prescribed criteria. The show was patterned after the Pilipinas Got Talent Show where both the judges and the audience were made active participants in determining winners by airing their comments and raising their score cards. The emceeing expertise of Capt. Borja made the show more entertaining. “I designed this activity to boost the morale of my men. I would want them to discover their potentials and provide a venue for them to showcase these talents. It’s surprising to see them perform like professionals,” was MGen. Mario Chan’s observation. The Commanding General and all other officers and civilian spectators were seen to have enjoyed watching one of the contestants performing a mesmerizing and entertaining act of magic which got an 8 as an over all rating of approval from the audience, especially from the kids. The second contender did a ballad rendition of a popular English song and received encouragements from the judges to further improve on his timing and diction. The last presentation was a dance remix coming from the Civil Military Operations Battalion group performers. The performance was a big hit, which automatically made them a qualifier in the grand finals. More of these talents will be unveiled on July 22 with five (5) more performances from the different units. The weekly winners will compete on its grand finals which is set on July 29, 2011. The search is just one of the many socio-civic activities being prepared by the 8ID in preparation for its 23rd Anniversary Commemoration on August 1. TACLOBAN CITY – Database accuracy of indigent beneficiaries of government-sponsored social welfare projects in the region. Leyte Governor Carlos Jericho Petilla pointed this to DSWD-8 officials and other representatives of various government agencies as he shared his experience on the Study Tour made by the Philippine Government last May to Mexico to observe on the latter’s implementation of “Oportunidades” - a Conditional Cash Transfer Program now being emulated here through the Pantawid Pamilyang Pilipino Program. Gov. Petilla stressed the need to conduct resurveys to validate and update its database of indigents conducted during the Department of Social Welfare and Development-National Household Targeting System for Poverty Reduction (DSWD-NHTS-PR). The survey list was made basis of the DSWD 4Ps expansion program. The 4Ps project awards cash grants for nutrition and schooling needs of kids belonging to indigent families. “In my recent visits to the barangays, there are poor families who were not included in the program and yet there are even those who have steady income, and one even encounter I have was one who sits as barangay chairman who was included in the indigent family category. I say this defeats the very purpose of 4Ps,” Gov. Petilla said. A number of families have already approached him, the governor said, claiming they are financially insufficient, with children below 14 years old which are some of the parameters used in listing a family as indigent under the NHTS. Meanwhile, DSWD-8 Regional Director Letecia Corillo said the department is steadily trying to re-evaluate the list following reports reaching their office that beneficiaries presently receiving do not belong to destitute families. She however pointed out that those validated to be indigent should religiously follow the conditions under which the cash help was granted, otherwise they would also be delisted from the ranks. To recall, last May 29, 2011, key stakeholders in the implementation of the Philippine Conditional Cash Transfer Program known as Pantawid Pamilya, led by DSWD Secretary Corazon Juliano-Soliman and DepEd Secretary Armin Luistro, went on a WB-AusAID sponsored Study Tour to learn more about Mexico’s experience with the CCT. Mexico has been implementing their own version CCT called Oportunidades for 13 years, covering a total of 5.2 million households and reaching 25 million individuals. Their experience and the technologies they have employed to ensure the effectiveness and stability of the program will greatly benefit the Philippines as it expands coverage for Pantawid Pamilya to 2.3 million households for 2011. Aside of ensuring database accuracy, Gov. Petilla also shared that Mexico’s “Oportunidades” cover children aged 0-22 years old, while in the Philippines, 4Ps covers children aged 0-14 years old. The group observed that this is one of the areas that will be given attention in exploring innovations on the coverage and monitoring of the program by creating tighter linkages to support supply side requirements on health and education and securing that the program is accepted and understood across the country.